Those who know me well know that hosting my cookbook club gatherings has become my biggest passion this year. I enjoy every aspect of it: from choosing the next book, to sifting through all the bookmarked recipes to arrive at a cohesive menu, to curating and crafting every last detail. And the details are many, location being one of the more challenging ones. While most people in Santa Barbara (including me) live in pretty tight quarters, we are truly blessed with endless outdoor options to host a crowd of any size, from a casual picnic with a few friends to a large wedding celebration, and everything in between. As beautiful and accessible as an outdoor space can be, in most cases it resolves the imminent challenge of just that—space—as everything else has to be hauled in. From real to makeshift tables to crates and totes full of dishes and glassware, I certainly hope that I will never run out of schlepping favors with my husband, Brett, and my gracious guests who help load it all back into the trusted Honda Element. But what can I say? Providing a beautiful space for people to commune over a delicious meal and conversation is just so incredibly rewarding. Read on for photos of a recent outdoor gathering I hosted and the recipe for Pear, Blackberry and Hazelnut Cake we all enjoyed at the end of the meal. All photos are by Lerina Winter. 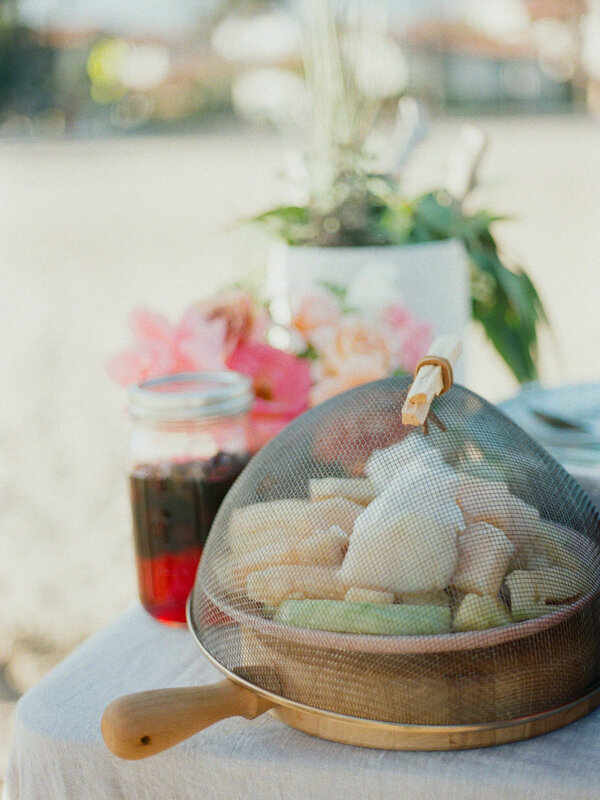 Our last gathering featuring Diana Henry’s newest book, How to Eat a Peach, was held Santa Barbara’s West Beach, and was pretty much the sum of all the challenges that an outdoor space can present. But what hurdles cannot be overcome in the name of the meal that tastes as delicious as it looks, with cake and homemade ice cream to top it off? I certainly can’t think of many. Why am I writing about a beach party at the end of October, you may ask, when most people find themselves firmly planted with both feet in the pumpkin patch, apple cider in hand? Because with all the hustle and bustle of the new school year, I completely forgot to tell you what I did last summer, which still hasn’t quite transitioned into the next season in my part of the country. This brings me the point I have been trying to articulate for a while now: given the effects of climate change, fall (or any season for that matter) has to become a state of mind rather than the weather report alone. To help anchor our gathering space on a widely-stretched public beach, I chose to work with The Cabana, Santa Barbara’s only resort-style cabana, umbrella, and beach chair rental service. Their team helped me with the key necessities for a successful beach gathering: shade, seating, and shelter. In addition, the bold white and red stripes of The Cabanas’ material were the perfect complement to the iconic West Beach setting, visually reaffirming once again our town’s rightful nickname—the American Riviera. To keep the sand out of the food, and the food away from the sand, I used two tables: one—a proper, albeit basic folding table—to serve the food, and another—a table of sorts—to gather around to enjoy the meal. The latter presented yet another challenge, logistical mostly, but in the end proved to be a worthwhile effort. A set of doors (hardware intact!) borrowed for the day from Restore, Habitat for Humanity’s building and home refurbishing warehouse, rested on wooden crates that were used to carry supplies to and from the beach. Layers of linen cloths covered both tables and provided much needed hiding space for extra supplies and containers. Culling an entire menu from How to Eat a Peach was not hard, and it honestly felt like I could not go wrong with any of the possible combinations. Henry’s recipes are easy to fall in love with, but to know that she herself is the master of putting menus together (starting from the age of 16) is a fact that can hang over your head should you read the preface of the book. Nonetheless, the menu came together beautifully, and we managed to find the best of local produce (even some late harvest peaches in September) to use in our respective dishes. To keep the food safe from birds (yet another challenge in outdoor settings), I used various covers which I collected over time and refurbished with driftwood and palo santo sticks as handles. Having hosted a few potluck events for Cookbook-ish, I am now able to easily spot the recipes that will stand the test of time and distance. Time, as in make-ahead recipes that don’t look stale or soggy the next day. Distance, as in easily transportable without any special containers. This Pear, Blackberry and Hazelnut Cake checked all the boxes and many more. I hope it will become your go-to dessert to bring to any gathering, indoor or outdoor. I know it is already my favorite. Preheat the oven to 375ºF and butter a loaf pan measuring 9½ x 5 x 2½ inches. Line the bottom with nonstick parchment paper. Toss 2 big spoonfulls of the flour with the pear and blackberries. Put the rest of the flour in a large bowl and add the baking powder, sugar, and salt. Mix together the yogurt with the regular olive oil in a cup and the eggs, vanilla, and orange zest. Stir the wet ingredients into the flour mixture, making sure the flour is properly mixed in, carefully fold in the floured fruit, and then the nuts. Scrape the batter into the prepared pan and bake 50 minutes to 1 hour, or until a skewer inserted into the middle comes out clean. Leave in the pan for 10 minutes, then carefully run a knife between the cake and the pan and invert onto a wire rack. Turn the cake over so it is the right way up. Let cool, then dust with confectioners’ sugar. Serve in slices, with extra blackberries on the side. Diana henry suggests serving sweetened crème fraîche or whipped cream with it, but we enjoyed a scoop of pink grapefruit and basil ice cream with it, also from the book. 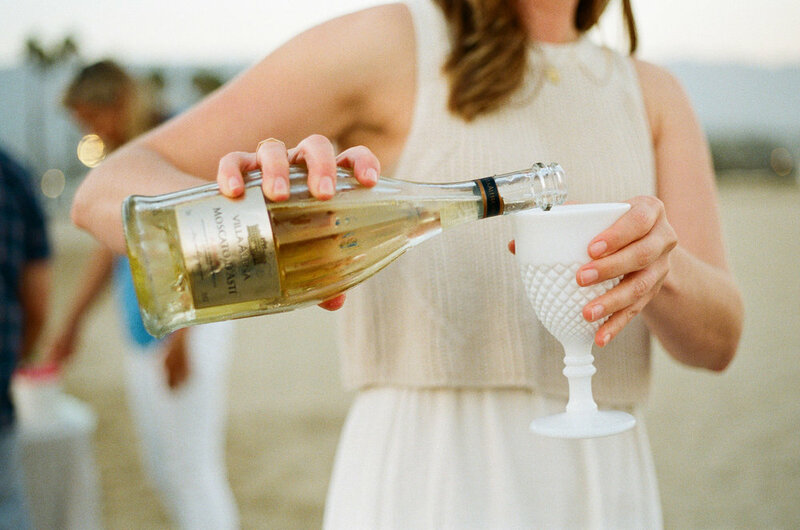 Cheers to summer, friends—past, future, or the kind that likes to linger well into November! Cookbook-ish is a book club and a community of like-minded foodies and creative people in my hometown. I curate the book selection and ask everyone to choose 2-3 recipes they'd like to make. I then come up with a cohesive menu based on everyone's selections. We cook at home and bring our respective dishes to share in a potluck style dinner. Next month's book is SIMPLE by Yotam Ottolenghi. Not in Santa Barbara? You can still participate by cooking and tagging your posts with #cookbookish_sb. Hosting a large crowd can be daunting, but it does not have to be. It is easy to fall into the mindset of worrying about what we don't have—or what we don't have enough of—in order to invite people over for dinner. With Thanksgiving and other major holidays just around the corner, some of us will probably end up with a few extra people at out table. Here are five things I learned while hosting a dinner party for twenty-five last month, as part of my cookbook club dinner series, Cookbook-ish. When dinner is at your house next time, I hope these tips will come in handy. All photos are by Lerina Winter. Location: Fairview Gardens Organic Farm. Unless it is a catered event, the obvious choice for organizing a large dinner party is a potluck. One thing I remember from hosting potlucks in the past, is that while people often want to bring a dish to share, they don’t always know what dish to bring. So, before it gets easy, it can get hard with everyone asking you the same question, "What can I bring?" One way to navigate this part of the process, and the exact mechanism I use for my cookbook club gatherings, is to ask everyone to cook something from the same cookbook. Chances are most people already have a trusted classic cookbook, or they can borrow your copy. For this Cookbook-ish gathering I chose The Art of Simple Food by Alice Waters. We ended up with quite a feast of four appetizers, two salads, and four main dishes. There were cookies with fruit compote for dessert, too. I knew that having individual menus printed for each guest was out of the question (did I mention twenty-five people and over ten menu items?). Enter Susan Silverberg, hand-lettering and calligraphy extraordinaire, who wrote the names of dishes on various objects and surfaces that were displayed next to the food. Choosing a neutral color palette for the table can provide the perfect backdrop when you have a variety of food and serving dishes to display. Think of it as a blank canvas for the communal art piece that everyone will have tried their hand in. First off, a neutral tablecloth. Nobody (including me!) has a big enough tablecloth to cover a table that seats twenty-five, and most people don't have a long enough table that's pretty enough to go uncovered. I don't use the term "life hack" lightly, so when I say "use a painter's drop cloth if you don't have a proper tablecloth", I really mean it. They are inexpensive and come in a variety of sizes. Just be sure to get one without the protective plastic lining, or you won't be able to machine wash and dry it. Layer smaller tablecloths over the drop cloths for a more dimensional look. Choosing one color for all the dishware helps keep the mismatched look from edging into the hodgepodge territory. Especially if all the chairs are different, too. Chances are you already have some plates in a solid, neutral color and can easily buy, borrow or rent a few extra ones in a similar color and style. I used vintage ironstone plates I collected over time and supplemented them with similar ones from a friend and long-time collaborator, Gretchen of Otis & Pearl. White plates aren't the most exciting choice and can certainly make the long table look like a scene from a cafeteria. To avoid the other extreme of having the table look too uniform, I mixed in salad plates in earth tones and vintage pewter. When it comes to flatware, I suggest using the same type of a metal while mismatching the patterns and styles. I might be slightly biased here, but I firmly believe that having high-quality napkins can make a lasting impression. Not everyone will have a chance to try all the dishes on the table, but everyone will touch the napkins and use them often throughout the meal. Natural fibers like linen are always my first choice. They have beautiful texture, won't leave any lint on your lap, and add an extra degree of style to the table. There is really no such thing as too many napkins and, unlike extra plates and cups, they take up very little drawer "real estate". I used FOLD linen napkins in mulberry for this event. After hosting a few larger gatherings for Cookbook-ish, I learned two things. One: I can't do it all by myself. Two: people like to help. By now I am not too shy to ask my guests to bring a few extra chairs unless it's a picnic, in which case I ask them to bring extra blankets. Cookbook-ish is a book club and a community of like-minded foodies and creative people in my hometown. I curate the book selection and ask everyone to choose 2-3 recipes they'd like to make. I then come up with a cohesive menu based on everyone's selections. We cook at home and bring our respective dishes to share in a potluck style dinner. Next month's book is How to Eat a Peach by Diana Henry. Not in Santa Barbara? You can still participate by cooking and tagging your posts with #cookbookish_sb. In my hometown of Santa Barbara we are spoiled with beautiful weather pretty much all year long. With the exception of a few months when the temps fall below or rise about 70℉, most people (including me) really enjoy bringing a picnic to the beach or to one of the many parks. Looking ahead to long summer days and inspired by my favorite new outdoor cookbook, Feast by Firelight by Emma Frisch, I decided to host last month's Cookbook-Ish gathering outdoors. For those who are hearing about Cookbook-Ish for the first time, it is a passion project and a book club for foodies that I started this year (more here). A friend and a creative collaborator, Margaret Lloyd of Margaret Joan Florals, hosted our group in her back yard surrounded by huge trees and her perfectly imperfect garden. She also created all the floral and foliage arrangements for the event. And while there was no crackling campfire or marshmallows, the setting truly captured the spirit of the book. The tables and benches provided by All Heart Rentals couldn't have been more perfect. 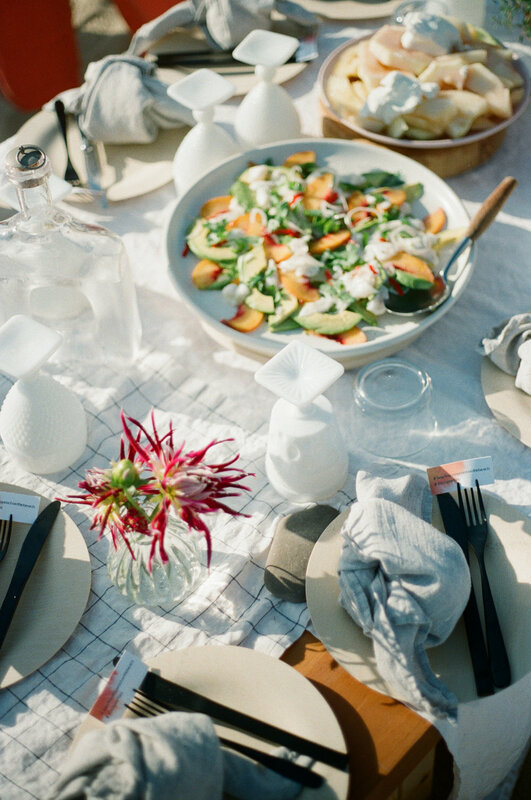 Read below for a favorite recipe from the menu and highlights of this no-fuss outdoor gathering that's full of intention and communal spirit. Picnics and camping require a lot of packing, which often translates into taking the easy route and bringing disposable plates and napkins. As an alternative I chose all the lightweight, non-breakable and reusable materials I could find. Black and white plaid linen napkins completed the look. An assortment of blankets and throws lined the benches, and some were available to the guests to use in the evening (April is still a bit chilly here). We enjoyed wine recommendations by Hana-Lee Sedgwick of Wander & Wine: Rosé, Pinot Grigio, California Chardonnay, light Pinot Noir. One of my all-time favorite foods to eat outside happens to be corn on the cob. I can easily put away two ears in no time. So, it was no surprise that my husband and I chose to make the Chile-Lime Festival Corn with Feta Cheese and Cilantro. And as a staunch "butter-and-salt" only person, I am converted to this magic concoction that's spicy, tangy, and really satisfying. Like many recipes from the cookbook, this one allows for the sauce to be made ahead of time and easily transported to your campsite or the picnic table. Here is the recipe, which I've already made once again. Finely grate the zest of the lime and set aside. Cut the lime into wedges and juice as many wedges as you need to yield 1 teaspoon lime juice. In a lidded jar or airtight container, combine the feta, yogurt, mayonnaise, red pepper flakes, lime zest, and lime juice and stir to mix. Seal the jar and then chill for up to 3 days. Pack the remaining lime wedges in a ziplock bag and chill for up to 3 days. Fire the grill or campfire to medium-high heat and position the grill grate 2 to 4 inches above the coals. Place the ears of corn over direct heat and, using tongs, rotate every 2 to 3 minutes until the ears are uniformly charred and the kernels bright yellow, 10 to 12 minutes. For a darker char, drizzle olive oil over the corn so it drips onto thecoals and the flames jump up to lick the corn. Transfer the corn to a serving plate or baking sheet. Shake the feta mixture to reincorporate and then spread evenly over each ear of corn and sprinkle with the cilantro. The meal was a combination of family style and buffet, with some menu items grilled on the spot and others made at home and brought to the gathering. When the sun set, the guests were enjoying the cookies, coffee, conversation, and a combination of candle light, moon light and solar light. A friend and I joked that the #feastbyfirelight turned into the #feastbysolarlight with the LED lanterns from Solight that she discovered at the Santa Barbara Earth Day festival the weekend prior to our dinner. As a party favor, everyone took home a smudgestick of fresh sage, lavender, and reship berries, made by Margaret. Once dried, it can be burned at home to release the fragrant scent that would hopefully remind us of our time together. Let the feast by firelight continue! Interested in joining the Cookbook-Ish community? Reach out via the "Contact" tab at the top of the page, and be sure to sign up for the News and Updates!